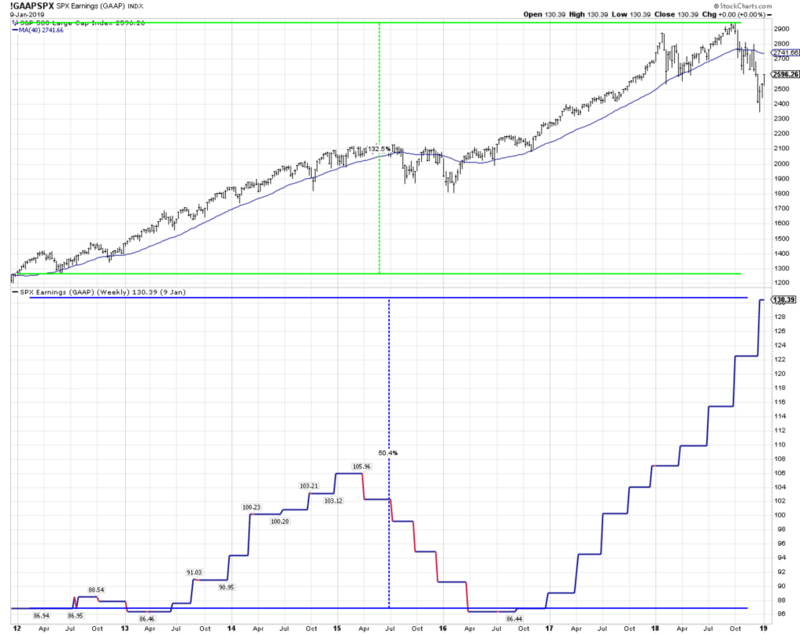 Equities are in a bear market and continue to offer a poor long-term risk-reward. The Fed's profligate monetary policy (zero percent interest rates and QE) artificially inflated stocks and led to a record indebtedness in the corporate sector. Overleveraged corporations will be vulnerable during the economic slowdown. We believe that the current bear market rally is almost over, and it's a good time to reduce your risk exposure. The stock market sell-off, which began in early October, accelerated in December and the S&P 500 and the small-cap Russell 2000 declined by 9.0% and 11.9%, respectively. Investors were fearful that the Federal Reserve was too hawkish and intent on raising interest rates despite a global economic slowdown and the uncertainty over the trade war with China. The S&P 500 fell by 13.5%, and the Russell 2000 dropped by 20.2% in the fourth quarter, which was the largest three-month decline since Q3 of 2011. Additionally, the S&P 500 and the Russell finished the year down 4.4% and 11.0%, respectively, which was their worst annual performance since the 2008 recession. While the economy and corporate profits were strong in 2018, we were concerned that a policy mistake – either monetary and/or trade-related – would lead to a global slowdown and potentially a bear market. After a sharp 11.8% correction in Q1, the S&P 500 recovered, but the international markets and the S&P 500 Financial, Industrial, and Materials sectors entered a bear market. As the Trump administration increased tariffs on China and the Fed drained global liquidity by “selling” bonds and raising rates, investors anticipated a global slowdown, sold their international equities and invested in the U.S. stock market. This “flight to quality” coupled with a record level of corporate buybacks drove the S&P 500 higher despite the hawkish Fed and the intensifying trade war with China. In fact, the market’s strength probably emboldened President Trump and the Fed to pursue more aggressive policies. The market’s breadth continued to narrow, and by the end of the summer, only a few mega-cap technology stocks (Apple, Amazon, Google, and Microsoft) were driving the market higher. Poor market breadth is typical in the late-stage of a bull market and usually presages a correction. On October 3rd, Fed Chairman Powell gave a hawkish interview, which provided the catalyst for a market correction. Powell stated that “interest rates are still accommodative, but we’re gradually moving to a place where they will be neutral,” and “we may go past neutral, but we’re a long way from neutral at this point, probably.” Since the Fed was on pace to raise rates four times in 2018 -- which nearly doubled short-term rates -- and global growth was slowing, investors believed that the Fed’s tightening cycle was almost complete. Powell’s new guidance surprised investors, who, fearing that the Fed was making a monetary mistake, sold stocks and drove the market lower. In December, the Fed made several more missteps. Despite the S&P 500’s 11.5% correction and the global economic slowdown, the Fed indicated that they would raise rates three more times in 2019 and stated that their Quantitative Tightening policy (i.e., selling $50 billion of bonds each month to reduce their balance sheet) was on autopilot. The Fed ignored the market’s message and investors panicked, which led to the stock market’s worst month of December since the Great Depression. For many investors, 2018 was confusing because stocks had their worst year since the recession, yet the economy was strong (i.e., nominal GDP grew at its highest rate since the last recession, and the unemployment rate fell to its lowest level in nearly fifty years) and corporate profits increased by more than 20%. In our view, 2018 can best be explained by what is good for Main Street, may not be good for Wall Street. From the “Great Recession” through 2016, the U.S. pursued a tight fiscal policy (higher taxes and more regulation), while the Federal Reserve conducted an unprecedented monetary policy of zero percent interest rates and quantitative easing (i.e., printing money to buy financial assets). While the tight fiscal policy led to the weakest economic recovery in the post-WWII era, the extremely loose monetary policy artificially inflated stocks and other risk assets. In this environment, “Wall Street” prospered, while Main Street struggled as living standards declined and wealth inequality rose to a level not seen since the 1920s. Beginning in 2017, pro-growth fiscal policy (lower taxes and deregulation) led to a strong economy, robust profit growth, and rising inflation expectations. While the economy had its best growth in a decade, the Fed raised short-term interest rates four times (nearly doubling short-term interest rates) and accelerated their quantitative tightening policy (“QT”), which sold bonds to shrink their bloated balance sheet by roughly $400 billion. These two factors placed considerable pressure on the stocks, which in our view, were priced for perfection. Are You Ready for The Economic Slow-Down? While a tight fiscal policy and a loose monetary policy helped “Wall Street” and corporate America at the expense of Main Street, the inverse, a pro-growth fiscal policy and a tight monetary policy, helped Main Street but led to the stock market’s worst year since the recession. Despite the twelve-month equity bear market, we believe that the market continues to offer a poor long-term risk-reward because stocks remain overvalued, economic growth is slowing, and profit margins are poised to decline as they regress to the mean. While we remain circumspect in the long-term, we believe that the Christmas Eve panic low was the end of the three-month 20% correction, and stocks are poised to move higher in the short-term. Typically, sharp market declines end when investors capitulate and drive stocks to an oversold level that is rarely seen. These capitulation lows provide a floor for the market and creates a positive short-term risk-reward. It appears that on Christmas Eve, investors panicked and created a capitulation low, which provided us with the opportunity to increase our equity exposure and participate in an oversold rally. Given the extreme fear exhibited by investors, we expect a solid rally, which will retrace more than 50% of the decline and rebound to roughly 2700 on the S&P 500. We believe that this will be a bear market rally and not a new bull market. Importantly, we will closely monitor the quality of the rally and performance of the yield curve, and credit spreads to determine whether or not there will be another significant leg down in the bear market. In conclusion, our asset allocation remains defensive and consistent with our view that risk assets are overvalued, the market offers a poor risk-reward, and the business cycle is decelerating. As value investors, we believe that the historic asset bubble that was created by the profligate Fed has ended, and as the asset bubble deflates, we will focus on preserving capital and providing positive absolute returns. Despite a 20% correction in the S&P 500, stocks remain overvalued and offer a poor risk-reward. After the “Great Recession,” the central bankers (Fed, ECB, and BOJ) enacted a Quantitative Easing (“QE”) policy, which bought more than $10 trillion of financial assets to drive stock prices to an artificially high level. The central banks believed that if they drove stocks higher, investors would feel wealthy and spend more money. They expected this “wealth effect” to stimulate the economy. While we don’t believe that QE helped the economy, it did lead to overvalued assets, malinvestment, and structural economic imbalances. Additionally, in our view, the Fed’s profligate QE program and the record stock buybacks by corporate America drove stocks far above their intrinsic value. We believe that fair value for the S&P 500 is 1500, which is approximately 40% below today’s closing price. In October of 2017, the Fed began their Quantitative Tightening (“QT”) program that sold bonds to reduce their bloated balance sheet. Since the ECB’s QE program was still active, the Fed’s liquidity reduction was offset by the ECB’s bond purchases. In October of 2018, the Fed increased the size of their QT program to $50 billion per month, which was more than the ECB’s QE program. We believe that this net reduction in global liquidity significantly contributed to the sharp drop in stocks during the fourth quarter. Importantly, since the ECB ended their QE program in December, the amount of liquidity removed from the system will increase again this month. Finally, in addition to the Fed’s QT policy, the U.S. Treasury is expected to sell $80 billion of bonds each month to fund the enormous budget deficit created by the tax cuts. We expect that the $130 billion per month reduction in global liquidity will continue to pressure stocks. In addition to artificially inflating stocks -- which contributed to significant wealth inequality -- negative real interest rates and QE incentivized corporate America to make bad investments and accumulate a record debt burden. The Fed’s monetary policy of zero percent interest rates and inflating stocks through QE led corporate America to “buy” and not “build.” Instead of investing in labor and capital equipment, corporate America borrowed to make acquisitions and buy back their stock. For example, in 2018, U.S. companies bought back a record $1 trillion of stock, which amounts to roughly 3.7% of the current market value. If companies borrowed to build, hire and make capital investments, instead of buying back stock, the return on their investment would help them grow and service their additional debt burden. Instead, the ill-fated buybacks had an ephemeral impact on stocks price, but a permanent impact on the companies’ balance sheet. For example, Apple, formerly the largest company in the world, bought back $62.9 billion worth of stock through the third quarter of 2018, and according to the Wall Street Journal, the repurchased shares are worth at least $9 billion less than what they paid. While the debt-free Apple can afford this malinvestment, many companies are now overleveraged and have little to show for their debt binge. Despite the bear market in equities, we increased our equity exposure to participate in what we believe will be a significant 12% to 15% bear market rally. Stocks were very oversold when investors capitulated on Christmas Eve, and we expect that the market will retrace at least 50% of the previous decline and rebound to roughly 2700 on the S&P 500. We will reduce our equity exposure to our long-term underweight position by selling into strength. At best, we expect the market to trade sideways in 2019. If the Fed remains on pause and the trade war ends, we believe the market will be range bound for 2019 and the S&P 500 will trade between 2350 and 2740. If there is a policy mistake (i.e., monetary or related to the trade war) or the weak global economy leads to a profit recession, we expect another leg down in the bear market. Do you have questions? Let us explain. In 2018, pro-growth fiscal policies (tax cuts and deregulation) drove the economy to its most substantial nominal growth since the third quarter of 2006, while unemployment fell to nearly a 50-year low and corporate profits grew at 20%. This period of strong growth led to two headwinds –the hawkish Fed and a trade war with China – which slowed global growth. The Fed’s monetary mistakes cause most recessions. The Fed typically raises interest rates into a slowing economy, which leads to a recession. The U.S. Treasury yield curve is a reliable indicator of expansionary or restrictive monetary policy. The yield curve flattens when the Fed is too tight and steepens when the Fed is accommodative. Historically, when the yield curve inverts (i.e., a two-year note yields more than a ten-year bond) a recession follows. In fact, yield curve inversions correctly signaled all nine recessions since 1955, with a lag of six to 24 months. There was only one false signal in the mid-1960s, which only lead to an economic slowdown. In 2018, the yield curve flattened significantly indicating that growth was slowing, and the Fed was too restrictive. While the Fed ignored the yields curve’s message for most of 2018, they recently capitulated and stated that they would be “patient” and they were “listening very carefully” to the market’s concern over an economic slowdown. Effectively, they indicated that their tightening cycle was on hold. Since the Fed paused before the yield curve inverted, it appears that recession is not imminent. Credit spreads and the ISM manufacturing survey confirm that the economy is slowing, but there is no recession on the horizon. We will continue to closely watch these market-based indicators, which along with the stocks market, should give investors an advanced warning of a recession. The trade war with China is the other headwind that is slowing the global economy. We believe that through most of 2018, President Trump was emboldened by the robust U.S. economy and the stocks market’s strength, especially relative to China whose stock market was in a bear market. Now, since both countries are in a bear market, it is difficult to gauge how the negotiations will proceed, and how aggressive the unpredictable President Trump will be. Let Us Show You How This Impacts Your Portfolio! Let's Talk! Despite the bear market, stocks remain overvalued and continue to offer a poor risk-reward. Since the “Great Recession,” central banks pursued a profligate monetary policy which created a tide of liquidity that drove financial assets to a historic level of overvaluation. The major central banks (Fed, ECB, BOJ), printed and bought more than $10 trillion of financial assets in an attempt to stimulate the economy by making investors feel wealthy so they would spend more. This flawed policy coupled with record corporate share buybacks drove stocks far from their intrinsic value. Also, the low-interest rates and inflated asset values led corporations to borrow and buy (share buybacks and acquisitions), instead of investing in their business. Today, corporations have a record debt burden, but since most of the debt was used for financial engineering, instead of capital investment, they have little to show for their bloated balance sheets. In addition to valuation, we believe that stocks are unattractive because earnings are poised to disappoint as profit margins fall due to higher interest expense and wage increases. Also, while the Fed’s monetary policy of zero percent interest rates and printing money to buy bonds drove stocks higher, we believe that their current policy of removing monetary accommodation by raising interest rates and selling $50 billion of bonds each month, will continue to reduce global liquidity and push stocks lower. While U.S. stocks are overvalued and offer a poor risk-reward, we believe that international and emerging markets are more attractive, on a relative basis, and should outperform the U.S. over the long-term. We estimate that the S&P 500 will provide a nominal return 5.3% per annum (versus 10% historically), while the MSCI EAFE Index (international stocks, ex-U.S. and Canada) the MSCI Emerging Markets Index should provide returns of 8.5% and 10.0%, respectively. Since 2012, stock prices appreciated by 132% (through the September all-time high), while earnings increased by only 50%. We believe that this substantial increase in valuation was due to the Fed’s QE program that bought $3.7 trillion of bonds and the corporate buybacks, which were funded by a 50% increase corporate debt. In the long-term, valuations and profitability regress to the mean. The Shiller PE, which attempts to smooth and cyclically adjust earnings, provides a reliable estimate of equity returns over the next ten years. Currently, the Shiller P/E is 28.5, which indicates that equities should provide a real return of 3.5% per annum over the next decade – historically, stocks have produced a 6.5% real return. Given that the 10-year Tips Breakeven indicates that inflation will be 1.8% per annum over the next decade, we estimate that stocks will appreciate by 5.3% per annum, which is significantly beneath its historical 10% return. The central bank’s easy money policies drove most asset classes to a historic level of overvaluation. Since 1950, private sector net worth (real estate and financial assets) has averaged 377% of GDP. In the third quarter, private sector net worth was 525% of GDP, which is nearly three standard deviations above the 65-year mean. The Fed’s unprecedented monetary policy of zero percent interest rates and printing $3.7 trillion to buy bonds, not only artificially inflated stocks but incentivized corporate America to make bad investments and accumulate a record debt burden. Cheap money and inflated assets encouraged corporations to “buy” and not “build.” Instead of investing in labor and capital equipment, corporate America borrowed a record amount to make acquisitions and buy back their stock. For decades, the Federal Reserve has attempted to manage the business cycle through incrementally more aggressive monetary policies. In each cycle, the Fed’s monetary mistakes have led to asset bubbles – e.g., the 2000 technology bubble, 2007/2008 housing bubble/financial crisis and the current bubble in corporate America. Similar to the previous consumer during the housing bubble, corporations leveraged up to buy artificially appreciating assets through acquisitions and share repurchases. Now that equities are in a bear market and the economic cycle is slowing, corporations are vulnerable because of their enormous debt burden. During this ten-year economic expansion, corporate debt increased by more than 50% to a record $9.6 trillion. While the amount of debt was growing, the quality was deteriorating. According to Morgan Stanley, the BBB-rated debt, which is one level above junk, rose from $686 billion to $2.5 trillion over the past ten years, and now represents nearly 50% of the investment grade debt market. Also, Morgan Stanley estimates that 55% of the BBB-rated bonds would be junk rated if analysts used leverage ratios instead of cash flow measures. Finally, Goldman Sachs estimates that $3.2 trillion of corporate debt, which is 62% of the investment grade market, will mature over the next five years. Many corporations will struggle to roll over their debt in the face of higher interest rates and stricter lending conditions. The corporate bond markets first big test will occur this year when $619 billion of IG bonds mature, compared to $51 billion last year. Artificially low-interest rates incentivized corporations to borrow and buy, instead of investing and building. The lack of capital investment will continue to hurt prospective economic growth. Currently, the corporate debt burden (corporate debt to GDP) has never been higher and is at a level synonymous with past recessions. Profitability has peaked for this cycle. Currently, corporate profits are 9.5% of GDP, which is 1.5 standard deviation above the historical mean of 6.9%. We expect that earnings growth will disappoint as profitability returns to an average level. In December, wages rose to 3.3%, which is the higher rate since the last recession. Accelerating wages typically signal that the business cycle has peaked. Additionally, while wage increases are good for Main Street, corporate profit margins and earnings will suffer. In the past decade, low-interest rates incentivized corporations to increase their debt burden significantly. Now that the business cycle has peaked, and stocks are in a bear market, corporations will find it challenging to roll their debt at favorable terms. From the “Great Recession” through 2016, the U.S. pursued a tight fiscal policy (higher taxes and more regulation), while the Federal Reserve conducted an unprecedented monetary policy of zero percent interest rates and quantitative easing (i.e., printing money to buy financial assets). While the tight fiscal policy led to the weakest economic recovery in the post-WWII era, the extremely loose monetary policy artificially inflated stocks and other risk assets. In this environment, “Wall Street” prospered, while Main Street struggled as living standards declined and wealth inequality rose to a level not seen since the 1920s. Beginning in 2017, pro-growth fiscal policy (lower taxes and deregulation) led to a strong economy, robust profit growth, and rising inflation expectations. In our view, the economic strength led to two significant headwinds – the Fed’s tightening cycle and the trade war with China. In fact, we believe that the strong economy and robust stock market emboldened the Fed and President Trump to pursue hawkish policies. For most of 2018, we thought that the odds of a policy mistake (either monetary or trade-related) were high. The bear market in global stocks and commodities coupled with the flat yield curve confirmed our view that the economy was poised to slow substantially. This month, the Fed finally heeded the message of the market and indicated that they would be “patient” and “listen to the market.” While the Fed appears to be on pause, the trade war with China -- the other headwind to economic growth -- remains uncertain but seems to be headed in the right direction. While a profit recession would not surprise us this year, we don’t believe that a recession will occur in the U.S. Market-based indicators (the yield curve, credit spreads, and the ISM Manufacturing Survey) do not confirm the bearish message from the stock and commodity markets. Historically, when the yield curve inverts (i.e., a two-year note yields more than a ten-year bond) a recession follows within six to twenty-four months. In fact, yield curve inversions correctly signaled all nine recessions since 1955. Since the yield curve is not inverted, we believe that a recession is not imminent. We will continue to closely monitor the market-based indicators, which should give an advanced recession warning. To their chagrin, the Fed ignored the message of the yield curve for most of 2018. Through their December meeting, the Fed was forecasting three more rate hikes in 2019, while the yield curve indicated the Fed was making a monetary mistake. Finally, this month, the Fed indicated that they would pause their tightening cycle – we hope it’s not too late. While Baa credit spreads have increased by 0.70% in the last twelve months, they are only slightly above 2.0%, which is their sixty-year average spread. Normal credit spreads indicate a low risk of recession. Stocks are in a bear market, and a historic asset bubble is deflating. Equities remain overvalued and offer long-term investors an unfavorable risk-reward. As the Fed shrinks their balance sheet and the profit cycle slows, we believe that stock valuations and profit margins will continue to regress to the mean. We estimate that fair value for the S&P 500 is 1500, which is 40% below the current value. The Fed’s profligate monetary policy of zero percent interest rates and QE created a corporate debt bubble. Over the past decade, corporations amassed a record debt burden, which makes them vulnerable as the economy slows and elevated profit margins regress to the mean. The current excesses in the corporate sector are similar to the excess in the consumer and financial sectors during the previous collapse of the housing bubble. 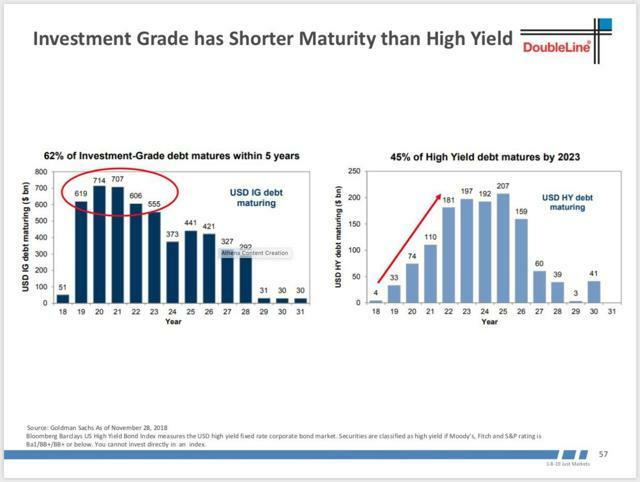 This year corporations will be tested as approximately 12% of the investment grade debt market matures. Our asset allocation remains defensive and consistent with our view that risk assets are overvalued, the market offers a poor risk-reward, and the business cycle is decelerating. As value investors, we believe that the historic asset bubble that was created by the profligate Fed has ended, and as the asset bubble deflates, we will focus on preserving capital and providing positive absolute returns until the market offers a favorable long-term risk-reward. Is your portfolio ready for an economic slow-down?